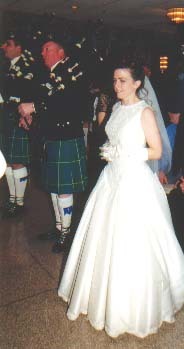 Richie Janniello and Marianne Marcellino were wed on November 18th, 2000. They were engaged in Ireland, married in the United States and honeymooned in Italy. 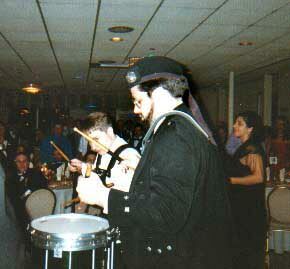 The band was privileged to play at this predominantly Italian reception, and was well received. 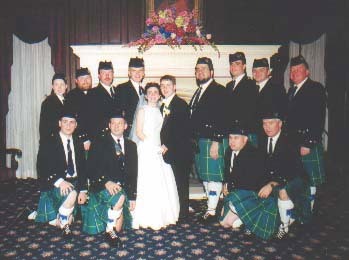 Back row (L - R), Mary Hamilton, Dan Hamilton, Tom Hoins, Lachlan Cameron, the beautiful bride Marianne Janniello, the handsome groom Richard Janniello, Martin Duffy, Jared Brogan, Eddie Cameron, Joe Brady, Jr., front row (L - R) Byrne O'Sullivan, Joe Jacobs, Rob Cirincione, Ken Meagher. 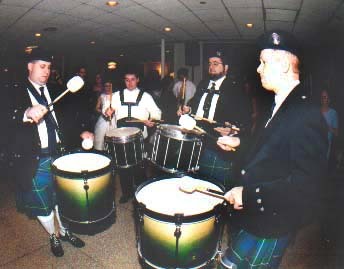 Tom Hoins (left) and Eddie Cameron leading the band into the reception hall. 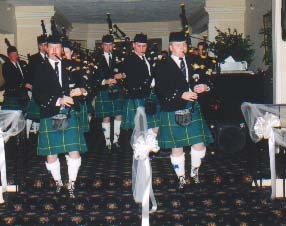 Martin Duffy (front) and the groom playing away. Hosbilt drums for this special occasion. but she greatly enjoyed the band performance. The Janniello Family Richie is a ranking prize winner amongst grade three snare drum soloist. He was recently upgraded by the EUSPBA to grade two. Marianne plays the alto drum in Monaghan's tenor line and serves as the grade five tenor instructor. This happy couple celebrated their wedding on November 18th and began living happily ever after in Harrison, New York. If you would like to see more of Rich and Marianne, click here to visit their special web site.